Acock assumes that the user is not familiar with any statistical software. This assumption of a blank slate is central to the structure and contents of the book. 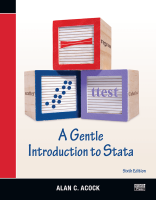 Acock starts with the basics; for example, the part of the book that deals with data management begins with a careful and detailed example of turning survey data on paper into a Stata-ready dataset on the computer. When explaining how to go about basic exploratory statistical procedures, Acock includes notes that will help the reader develop good work habits. This mixture of explaining good Stata habits and good statistical habits continues throughout the book. Acock is quite careful to teach the reader all aspects of using Stata. He covers data management, good work habits (including the use of basic do-files), basic exploratory statistics (including graphical displays), and analyses using the standard array of basic statistical tools (correlation, linear and logistic regression, and parametric and nonparametric tests of location and dispersion). He also successfully introduces some more advanced topics such as multiple imputation and multilevel modeling in a very approachable manner. Acock teaches Stata commands by using the menus and dialog boxes while still stressing the value of do-files. In this way, he ensures that all types of users can build good work habits. Each chapter has exercises that the motivated reader can use to reinforce the material. The tone of the book is friendly and conversational without ever being glib or condescending. Important asides and notes about terminology are set off in boxes, which makes the text easy to read without any convoluted twists or forward referencing. Rather than splitting topics by their Stata implementation, Acock arranges the topics as they would appear in a basic statistics textbook; graphics and postestimation are woven into the material in a natural fashion. Real datasets, such as the General Social Surveys from 2002, 2006, and 2016, are used throughout the book. The focus of the book is especially helpful for those in the behavioral and social sciences because the presentation of basic statistical modeling is supplemented with discussions of effect sizes and standardized coefficients. Various selection criteria, such as semipartial correlations, are discussed for model selection. Acock also covers a variety of commands available for evaluating reliability and validity of measurements. The sixth edition incorporates new features of Stata 15. All menus, dialog boxes, and instructions for using the point-and-click interface have been updated. Power-and-sample-size calculations for linear regression are demonstrated using Stata 15's new power rsquared command. This edition also includes new sections that describe how to evaluate convergent and discriminant validity, how to compute effect sizes for t tests and ANOVA models, how to use margins and marginsplot to interpret results of linear and logistic regression models, and how to use full-information maximum-likelihood (FIML) estimation with SEM to address problems with missing data.